In the previous section you added a compensator to the power stage, closing the control loop. The AC response of the converter shows adequate small-signal stability in terms of gain and phase margin. The next step is to verify the large-signal stability in the time domain when a load transient is applied to the converter output. SIMPLIS runs the three simulations (POP, AC, and Transient) in that order, which means that the transient simulation begins with the converter in steady state. Only the transient data is shown on the waveform viewer. The transient simulation starts at the last data point from the POP simulation; that is, the POP simulation determines the initial conditions for the transient simulation. During a POP simulation, the pulse current source is held at its initial value of 0A. How to configure the circuit for a load transient test using a pulse current source. How the POP trigger conditions affect the initial conditions for the transient analysis. To set up the load transient simulation, you will add a pulse current source in parallel with the load resistor and change the output load resistor value. The converter will be set to start with a 50% load (5A) provided by the load resistor; the current source will apply a 0-5A load pulse. The load timing will be set to apply a worst-case pulse load for this trailing edge modulator. The step-up occurs when the PWM modulator turns off the high side MOSFET. The step-down occurs when the PWM modulator turns the MOSFET on. The timing for the load transient can be set precisely during a POP/Transient analysis. To get started, you will need the schematic from the last section. You can download a schematic at this stage here: 11_SIMPLIS_tutorial_buck_converter.sxsch. Select the inline current probe (IL); press Ctrl+C to make a copy; and then press Ctrl+V to paste the current probe to the right of the load resistor R1 as shown below. Double click on the probe, and rename the probe PULSE LOAD. In the part selector, double click on the Current Sources category to expand the list. 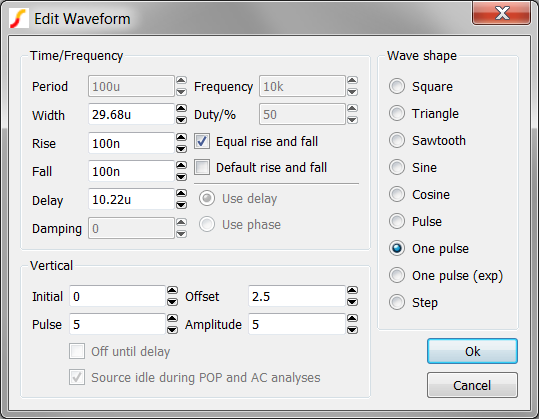 On the right side of the dialog in the Wave Shape section, select the One pulse radio button. In the left column, change Delay to 10.22u. Note: This delay time is equal to 5 switching periods plus a single on-time of the MOSFET. Result: This will delay the start of the load pulse until right after the switch turns off, producing the worst-case load transient. In the first column near the top of the dialog, change Width to 29.68u. 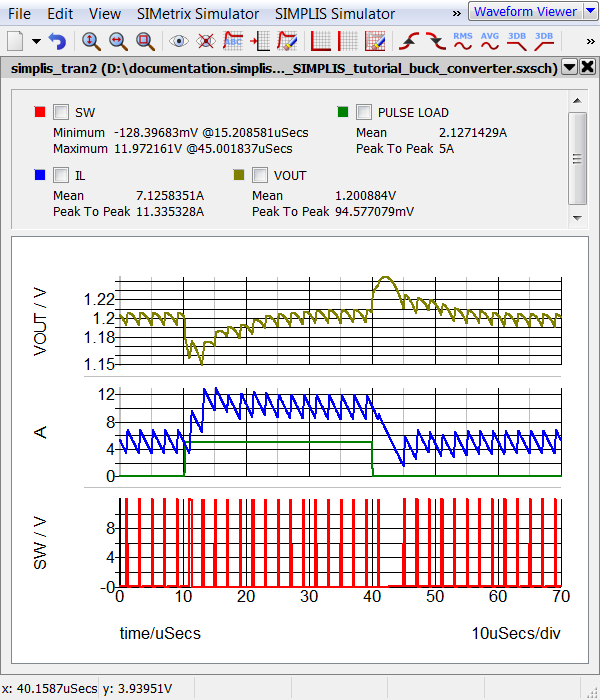 Result: The Width, when added to the Delay and Rise parameters, will delay the load step-down time to 40us. Uncheck Default rise and fall . In the Rise field, enter 100n for the rise time. Double click on the load resistor R1, and change the value to 240m. Now that you have configured the schematic for the pulse load test, you are ready to set the analysis parameters to run a POP and transient simulation. 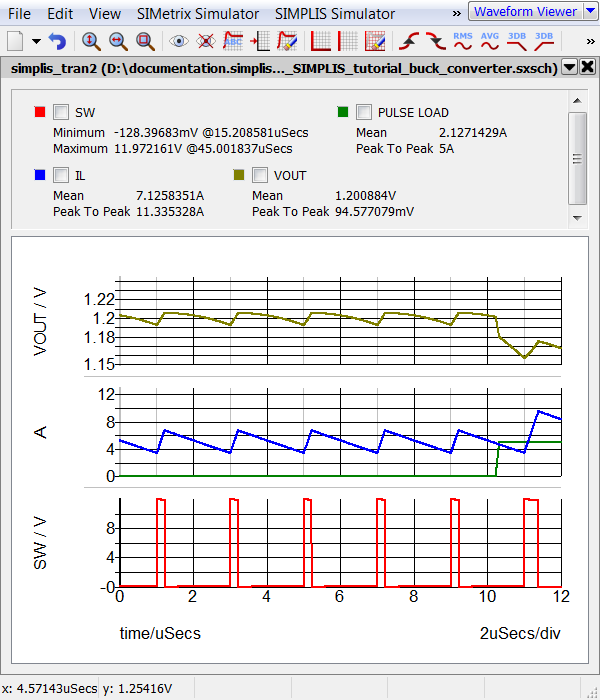 The stop time for this simulation is set to 70us, which is long enough to for the converter to recover from the load transient and enter steady-state. Uncheck AC, and check Transient. In the Analysis parameters section, set the Stop time to 70u. To run the POP/Transient simulation, click Run button. Result: SIMPLIS runs POP and Transient simulations. 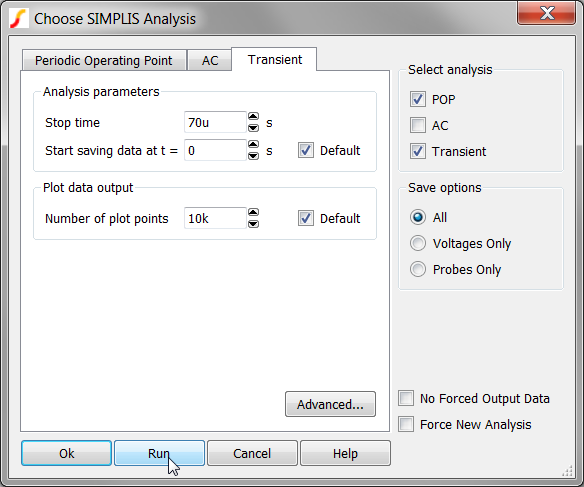 After the POP simulation, SIMPLIS takes the initial conditions of the circuit and applies them to the Transient simulation. The Transient simulation starts with the converter in steady-state. The POP trigger conditions are the reason for this apparent time shift. In 5.1 Building a Compensator, you moved the POP trigger gate from the switching node to the oscillator source. 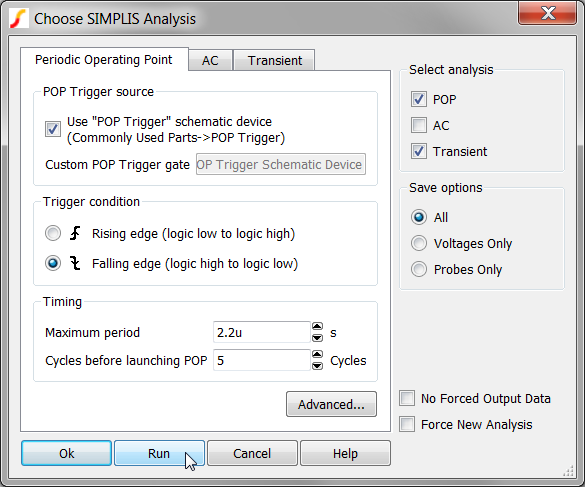 The POP analysis settings include an edge direction, and the default setting is to trigger on the rising edge. Since the POP Trigger is finding the 500mV level of the rising edge of the oscillator sawtooth ramp, the POP period starts at a time midway between the switching node rising edge. Since the transient analysis begins at the final time point from the POP analysis, there is a 1μs time shift in the transient waveforms. In the next section you will change the POP Trigger Edge and see the effect on the transient waveforms. Click on the POP Tab and then select the Falling edge (logic high to logic low) radio button. Click Run to rerun the POP/Transient simulation. Result: The simulation runs again, but with a falling edge POP trigger condition. Because the POP Trigger condition is set to the oscillator falling edge, the MOSFET turns on slightly after t=0, t=2μs, t=4μs, etc. The timing of the pulse load is now aligned with the expected switching period and, therefore, the worst-case load transient timing conditions are used. It is now obvious how the output voltage deviation from steady-state is affected by the timing of the load pulse. The first simulation applied the pulse approximately 1us later (or earlier) in the switching period than the desired worst-case conditions. In the previous section, you set up the converter to run a POP and Transient simulation. This was done for clarity because a single graph tab with the transient results is output for each simulation. You can run an AC simulation in combination with both the POP and transient simulations. SIMPLIS will run the resulting POP/AC/Transient simulations in that order. 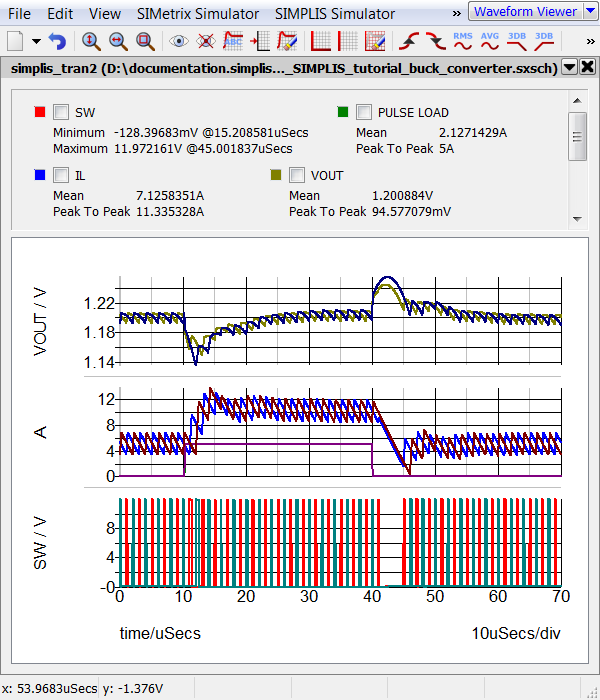 Running a POP/AC/Transient simulation allows you to examine both the large- and small-signal behavior of the circuit. In the Select analyses section on the right, check AC. Result: The waveform viewer opens with two tabs: an AC tab and a transient tab. The transient tab shows the large-signal behavior. To view the small-signal behavior, click on the AC tab. A schematic saved at this state can be downloaded here: 12_SIMPLIS_tutorial_buck_converter.sxsch.